The Killing Season explores one of the largest and swiftest, yet least examined, instances of mass killing and incarceration in the twentieth century--the shocking antileftist purge that gripped Indonesia in 1965-66, leaving some five hundred thousand people dead and more than a million others in detention. An expert in modern Indonesian history, genocide, and human rights, Geoffrey Robinson sets out to account for this violence and to end the troubling silence surrounding it. In doing so, he sheds new light on broad and enduring historical questions. How do we account for instances of systematic mass killing and detention? Why are some of these crimes remembered and punished, while others are forgotten? What are the social and political ramifications of such acts and such silence? Challenging conventional narratives of the mass violence of 1965-66 as arising spontaneously from religious and social conflicts, Robinson argues convincingly that it was instead the product of a deliberate campaign, led by the Indonesian Army. He also details the critical role played by the United States, Britain, and other major powers in facilitating mass murder and incarceration. Robinson concludes by probing the disturbing long-term consequences of the violence for millions of survivors and Indonesian society as a whole. 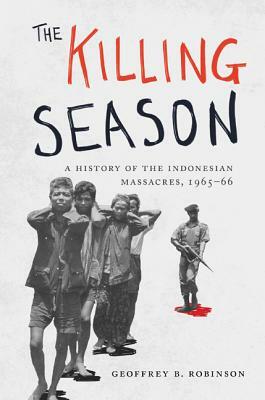 Based on a rich body of primary and secondary sources, The Killing Season is the definitive account of a pivotal period in Indonesian history. It also makes a powerful contribution to wider debates about the dynamics and legacies of mass killing, incarceration, and genocide. Geoffrey B. Robinson is professor of history at the University of California, Los Angeles. His books include The Dark Side of Paradise: Political Violence in Bali and "If You Leave Us Here, We Will Die" How Genocide Was Stopped in East Timor (Princeton). Before coming to UCLA, he worked for six years at Amnesty International's Research Department in London. Robinson lives in Los Angeles with his wife and daughter.